4K TV is Here For Your Home Theater! But Should You Care? Well we saw the cool new 84" LED 4K displays at the recent CEDIA Expo in Indianapolis ("4K" is the new buzzword referring roughly to the amount of vertical lines of resolution a TV, video display or projector is capable of displaying, which is double today's high-definition standard of 1920 lines). 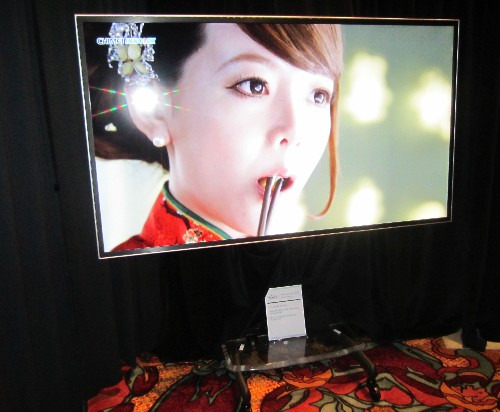 Both Sony and Runco were showing the 20-25k-ish sets off with dazzling HD imagery. Also, there were 4K front video projections systems by JVC, SIM2, and Sony. 4K video resolution is the next "must have" technology that video display and projector manufacturers will be luring you with for your high-end home theater or media room. The only problem is that they were showing 4K source material which us regular schlubs can't get yet. It's a bit of a tease. I understand that we, as Americans, always crave bigger, badder, stronger and faster (insert Tim Allen grunt here) but I am not sure we are getting much value out of these extra pixels. A standard HD display is 1,080 horizontal lines of pixels by 1,980 vertical lines while the new 4K displays bump you up to 2,160 by 3,840 lines of pixels. This is great if you sit REALLY close to your home theater screen because you will not be able to see the pixel structure, but are you getting more information? More detail? Better color? The answer is no. Our current source material (DirecTV, Cable TV, Dish, Blu-ray, even PRIMA Cinema maxes out at 1920 x 1080 resolution. The TV's video processor now has to scale that image up to the 3,840 x 2,160 resolution. Oftentimes this results in nasty picture artifacts, which are errors in the up-scaling process. So, depending on the quality of the video processor, the picture could actually be worse on a 4K set since it has to do a bunch of technical backflips to monkey with the image to light up those extra pixels. So how long before we have 4K Blu-rays, DirecTV, Dish, Time Warner, etc.? Well it may be some time before this happens. With Blu-rays there is no firmware update to accommodate the additional resolution. A full-scale hardware redesign needs to happen and probably will be called something different than Blu-ray. For the broadcasters, a completely new (and expensive) infrastructure is required to deliver 4x the video information on each of its channels. And guess what? They can't charge more for 4K advertising than 1080p advertising so don't hold your breath. I don't want to poo-poo this technology since I can't wait until our TV's are so good they naturally look three dimensional but we will not fully take advantage of the benefits of 4K until we feed our TV's 4K content, and then, you will have to sit really close to your video display to enjoy those benefits.